Doves and pigeons seem like such quiet birds yet they can sure create strong opinions when it comes to where they decide to roost. 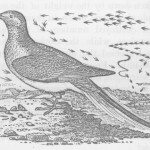 Whether you love these birds or despise them and their droppings, this collection of vintage dove and pigeon images may be used to express your opinion and your creativity. 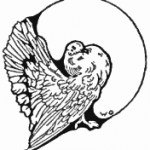 Whether you are looking for a copyright free dove image or a copyright free pigeon image, you’ve come to the right place. Let your creativity soar with these public domain bird images from Reusable Art and the many talented book illustrators and artists represented. Black and white pigeon image. With a puffed chest and a regal bearing, this pigeon proudly shows off his grand plumage. 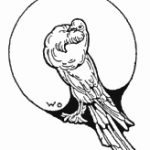 Simple black and white drawing of a pigeon in flight. 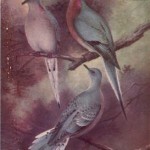 Beautiful colored drawing of three pigeons. 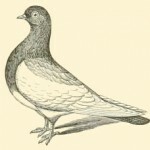 Public domain drawing of a colorful pigeon. With a puffed chest and a regal bearing this pigeon struts his stuff. A group of doves sit on a ledge above a clock. 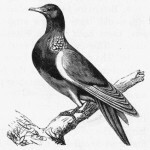 Black and white drawing of a pigeon. 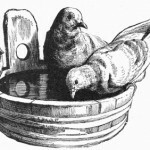 Sweet vintage drawing of a pair of doves and another bird getting a drink. 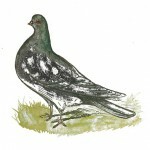 Vintage and grunge dove drawing.